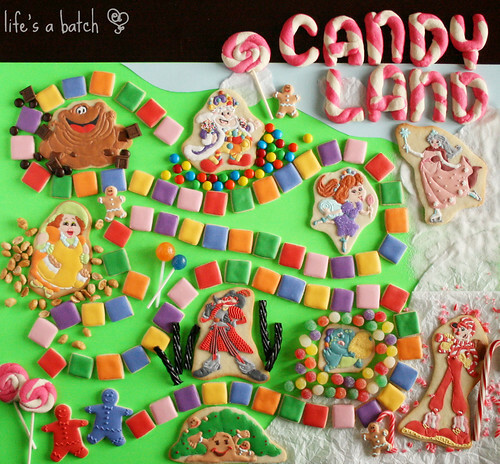 Play With Your Food – Candy Land Version! And now, indulge me for a moment while I “play with my food” for a bit. 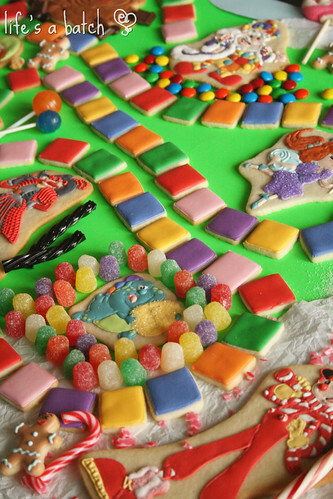 I chose to remake the classic board game Candy Land in cookie fashion, and I had so much fun challenging myself! It’s been a while since I played Candy Land (my boys are now 11 & 14 years old! ), and I was in for a surprise. The game & illustrations have changed a LOT over the years, especially since the version I played with in the 80′s! See? I decided to work with the most recent version, in the hopes that the little children in my life would recognize it more easily. That made things a bit tougher than the vintage game, but the longest part was simply making all the colors. 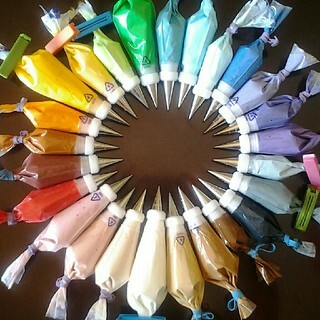 Look how many colors were involved! Once the colors were ready, the decorating part was easy. 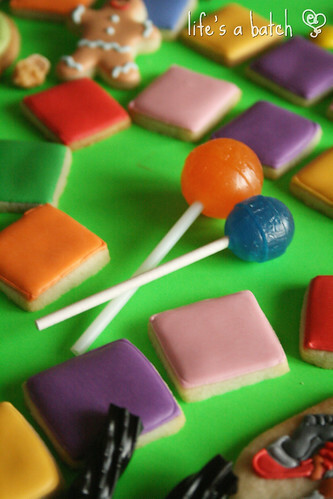 Here’s the new, cookie version of Candy Land! Isn’t it fun?! It was hard to keep my boys away, especially with all the bits of real candy spread out all over the dining room table. 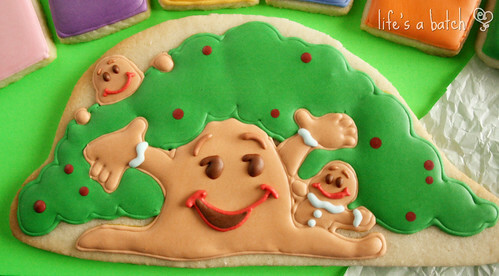 But please, come on a walk with me through my cookie-fied game land! To start, pick your playing pieces. 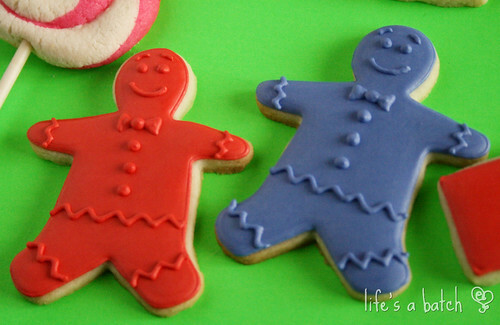 Aren’t these little guys adorbs? In fact, get used to these guys. 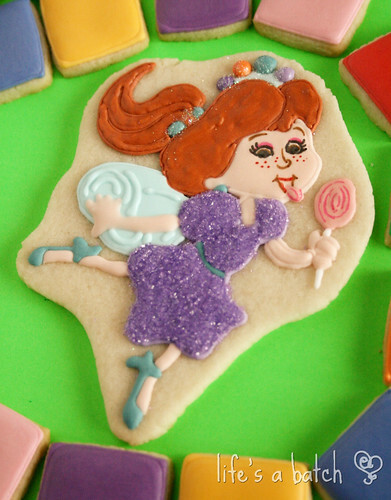 They’re all over Candy Land, hiding & helping as you work your way around the game. Pretty soon, you’ll meet up with Mr. Mint in the Peppermint Forest. Isn’t he a trip?! I love his peppermint buttons! 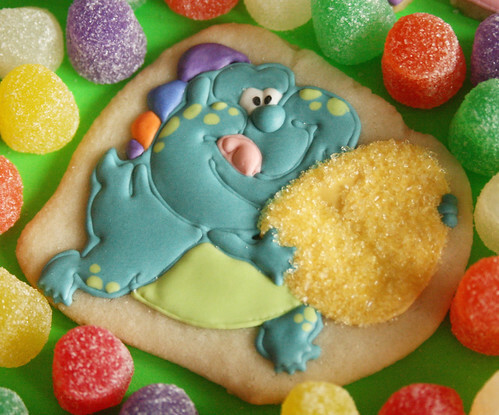 Just around the turn is Gumdrop Mountain, complete with a happy fellow named Jolly! But don’t fall off the path, because coming up quick is the evil Lord Licorice! 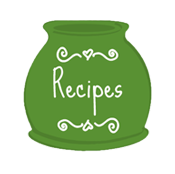 Once you’ve escaped him, continue on the path heading towards Peanut Acres. 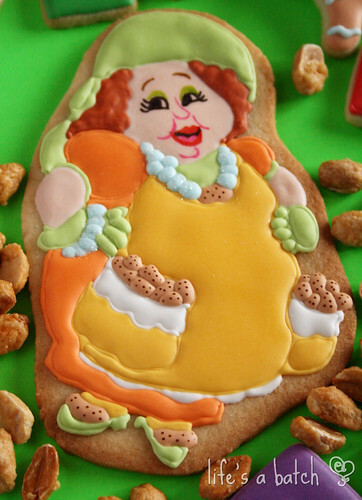 There, you’ll meet up with Gramma Nutt, and she has pocketfuls of peanut treats waiting for you! You’ll pass through Lollipop Woods, and you can make friends with Lolly. Travel back across the land board, and be careful of the Chocolate Swamp! 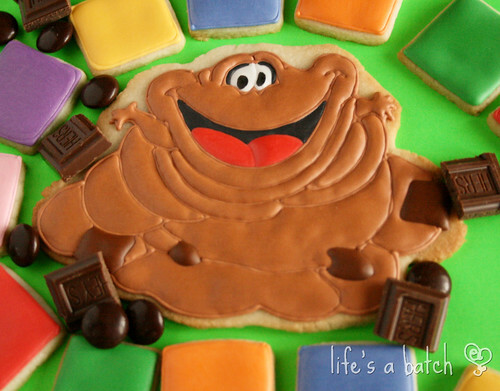 Don’t worry about sweet Gloppy, though – he’s as happy as can be! Just a few more sweet steps, and you’ll have made it to King Kandy! He smiles as he shows you his Candy Castle in the distance. You’ve made it! 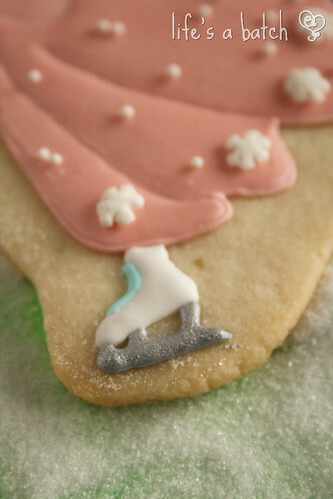 You won, battering your way past all the confectionary obstacles. Hooray! And if you find that you’ve not suffered a diabetic coma yet, skate around to the beginning & start a new game! Simply amazing, although there’s nothing simple about it!! Such talent, creativity, and inspiration to keep practicing! Thank you! 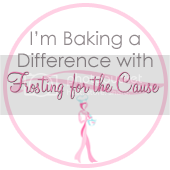 It was a labor of love, and I’m dying for the gal I surprised with the cookies to receive them! Wow! Absolutely amazing! I can’t even begin to imagine how long this took you. All of the characters are stunning and I love how you did the logo! Thank you, Janine! They turned out really well, I think, so it was worth the SIX HOURS in mixing colors, haha! Thanks, Margaret! I’m glad you obliged me through my sometimes-dorky posts. Oh my goodness…..so much work went into this. It is just truly “eye candy”…..I love the two side by side comparisons of the old board and new. Thank you, Vicki! 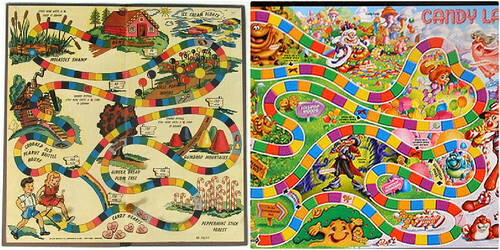 I really was surprised to see the massive differences, but I found it really cool to look at all the different ways Candy Land has “evolved” over the years. Oh Jill, you are always so SWEET! Cathy, what sweet words! I’m glad you enjoyed it so much! I wish I could promise you a set for your birthday, but having made all those icings for hours, I’m kinda thinking this is a “one-time thing,” haha! LOL, thank you! Losing sleep? Oh Krista, you know me so very, very well. 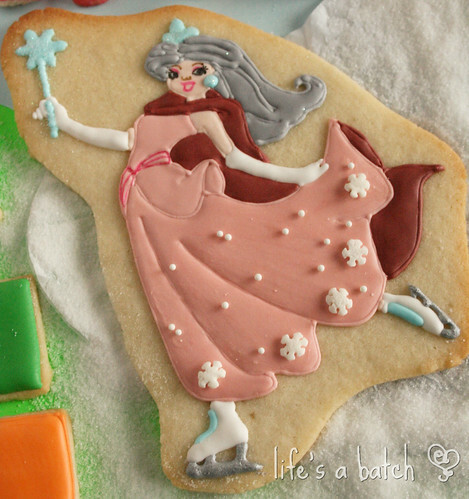 These have to be some of the most amazing cookies I have ever seen!! Seriously… and I am not just saying that cause you are my friend! haha! Yeah, you are! But serious biz, I still like hearing it anyway! 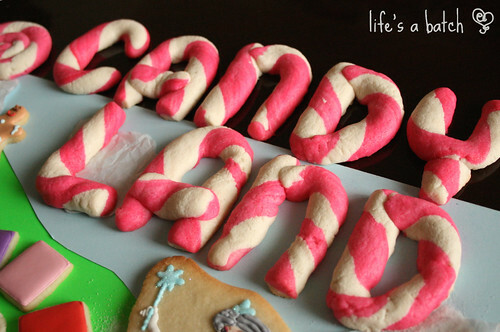 This Candy Land project of yours was a phenomenal undertaking! You did an amazing job on everything Nicole. I’m always blown away by your attention to detail. Thank you, Paula! It was a sweet project I couldn’t refuse, and I can’t WAIT for the friend I surprised with the whole set to get her cookies already! She has no clue it’s coming! P.S. – I need to write you a letter! Holy COW!!! 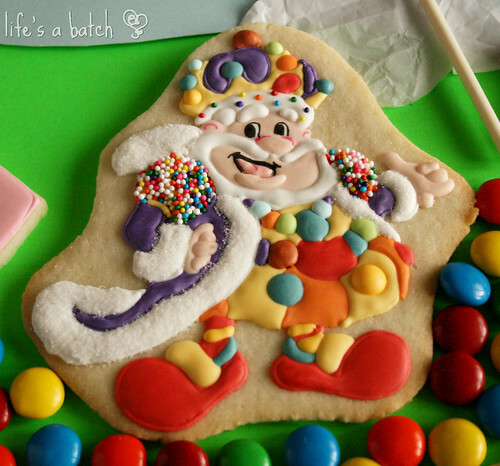 I can’t believe you made all the candy land characters!! This is seriously awesome!!! LOVE IT and would NEVER EAT IT!! I would frame it!!! Thank you, Lisa! 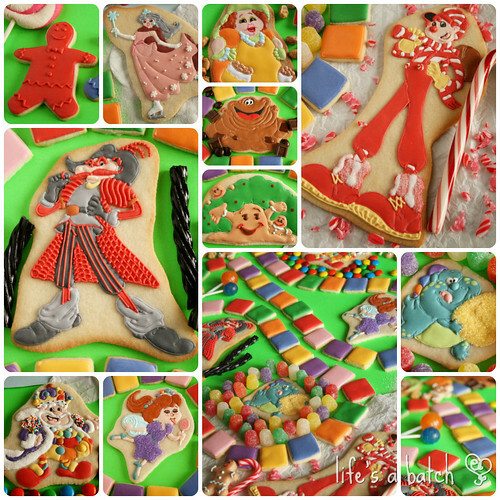 I had fun making each cookie, imagining the glee on my friend’s little girls’ faces when they receive their cookie board game this week. I can’t wait to hear their reactions! I LOVE the chocolate swamp!!! Thanks! Isn’t Gloppy so fun-looking?! These are all insanely detailed and utterly incredible! You deserve some sort of award I think. A gold statue or blue ribbon. Something. All I have to say is I’m in complete awe of your talent! Kudos to you!!! Oh Renee, you are too kind! I know for a fact that YOU are the ultimate artist, especially in getting such perfect details. I’m VERY flattered by your words – thank you! Mind-blowingly awesome!!!! I can hardly imagine the time and work that went into all this!! Beautiful job!! The detail work on these is insane! Your have much more patience than I! Thank you, Carrie! It was a “one-time thing” kind of project, for sure. 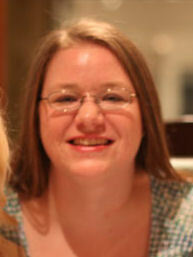 Thank you, Cristin! 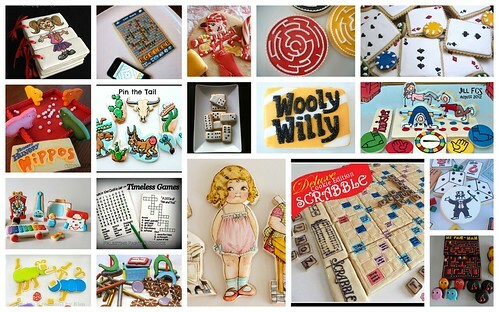 It was a challenge, but I had fun making the cookie board game. The scope of your project is unbelievable! 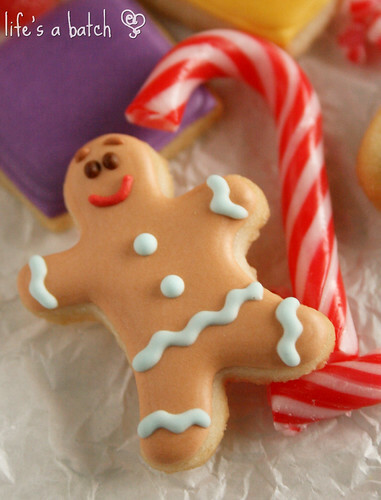 Each and every cookie is incredible. 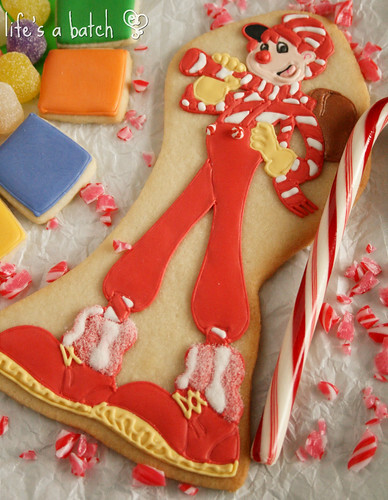 I mean — Lord Licorice??!! WOW. And you made the logo and the gameboard with all the little squares….This is seriously incredible!!! Thank you, Georganne! 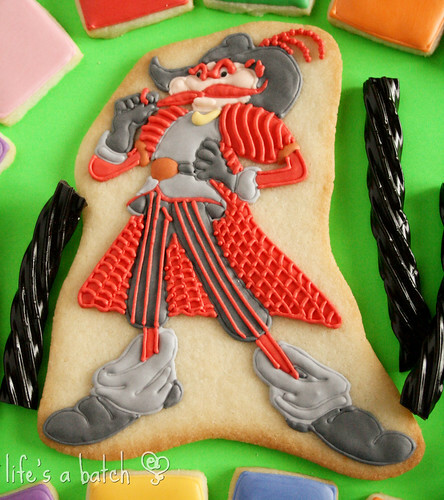 Haha, Lord Licorice does seem to be a fave for most people – including me!